DriveThruRPG: This title was added to our catalog on January 15, 2013. 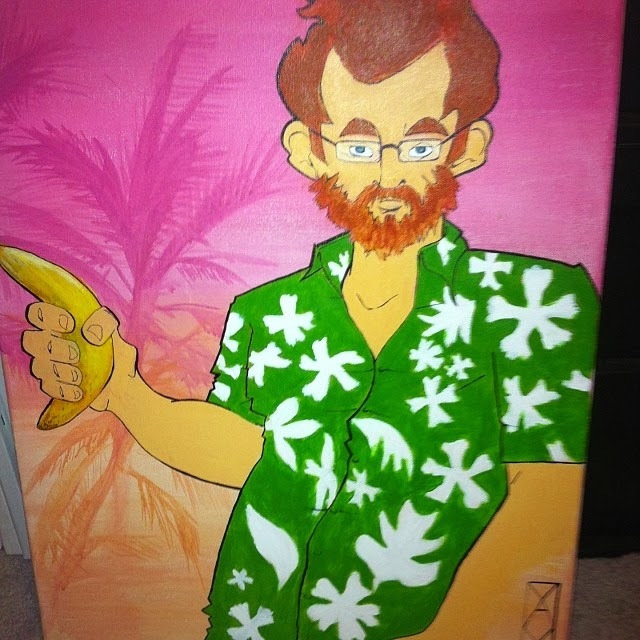 I backed your Indiegogo campaign at the $30 level and I still haven't received anything in the mail. I'm just wondering if you have a way of tracking when it got shipped, or if it hasn't been shipped yet? Sean Connors' youtube channel gets updated. I'm doing a rundown of all of the Indiegogo and Kickstarter campaigns I've funded that I haven't received yet and yours is the only one where you've announced that the books are shipping yet I still haven't received anything. Your last update claims the books should arrive by Christmas, but it's April now. Any response would be appreciated. Still no communication heard from Sean Connors. According to comments on the indiegogo page he has not spoken to anyone via email since December. The book has been done and available as a pdf for months, and there are several reviews on DriveThruRPG for it which suggests that the book is indeed selling there. As for me, I'm expecting some eventual public declaration that either A) he got sick and it incapacitated him so the project suffered some slowdown near the end, B) a relative died and coping with the stress tore him away from sending out the final books, C) he'll claim ignorance of any problems and insist books have arrived/the books are on their way, or perhaps D) all of the above. I'm not optimistic. Can you tell? But now it's spreading to other pages, I'm getting pagan spam on both older and newer posts I've made, and to stem the tide I have put up one of those 'type a word' comment gates. I hate those things when I have to go through them to leave a comment, and so, I apologize. I started with 1st edition because I knew it was the most random, and ended up making a dwarf fighter. Each edition afterwards was simply an attempt to recreate the character from the previous edition, using the rules and character creation methods of the later editions. Here are the stats, straight up, along with some notes I added for explanation. the Player's Handbook does not give any specifications on how to roll up a character, it just says The range of these abilities is between 3 and 18." so I'm just using the classic method of rolling 3d6 and putting them in the abilities as I roll them. Rolled 15, 11, 5, 8, 11, 8, the stats after racial modifiers are in the order the book ascribes to them. And that is ALL of the information the 1st edition Player's Handbook gives the player! I thought about just transferring the stats as is, but that wouldn't be fair to each version since I know 3rd edition uses a completely different method and I'll end up with much higher numbers. Using Method V from the rulebook (roll 4d6 dropping the lowest and assign where you like), since that's the one most 2nd edition games I've ever been in used. Dwarf = saving throws vs. wands/rods/staves, spells & poison +4; 20% of magic item failure if not made for dwarves; +1 to hit orcs, half-orcs, goblins, and hobgoblins; ogres, trolls, ogre magi, giants, and titans are at -4 to hit dwarves; infravision 60 feet; detect grade or slope in passage or new tunnel/passage construction 1-5 on ld6; detect sliding/shifting walls or rooms 1-4 on ld6; detect stonework traps, pits, and deadfalls or determine approx. depth underground 1-3 on ld6. Alignment: Lawful Neutral, Age 57, Height 4'2" , Weight 170 lbs. And now, finally, I determine starting ability scores. The method for randomly generating ability scores is downplayed in the rulebook with the words "On average, you’ll come out a little worse than if you had used the standard array. If you roll well, you can come out way ahead, but if you roll poorly, you might generate a character who’s virtually unplayable. Use this method with caution." I find it amusing that they are actually trying to encourage you to not roll dice. So using the standard method that they describe, I would assign ability scores as I see fit from the following numbers: 16, 14, 13, 12, 11, 10; adjusting for racial modifiers after placement. What I find even more amusing is that the numbers here are already arranged exactly in the order I would want them to be! Trained Skills (from the class skills, choose three): Athletics (Str), Endurance (Con), Streetwise (Cha) This is the first part that forcibly diverges from previous editions. Mitch has no animal handling or rope use equivalent amongst the class skills. I start with one feat, and there is one for Mounted Combat but it doesn't look like it's very useful or appropriate to the original concept, and there's one for Power Attack, but I'm taking something that fits the original concept better. Finally, we're on to equipment. The one thing that could clearly be improved about 4th edition is that all of this information is disorganized. The sequence of character creation has me flipping back and forth through the book, literally from chapter 3 to 4 then 2 then 5 to 6 back to 4 and then ahead to 7. And with that I just have to add all of the modifiers together to figure out the final stats. Whew! And now I'm done. The 4th edition version is obviously the most powerful, he is clearly defined as a powerhouse of destruction. The text blocks for 4th edition tend to come fairly simplified so despite the enormous amount of text written above 3rd edition is actually the most complex. It seems like 4th edition was trying to streamline 3rd edition, but in the process became a game of superheroic adventurers with very little connection to the original sulking and scavenging game that once was D&D. Surprisingly, and I can only speak for myself, the 2nd edition version seemed the most interesting - it's the most concise and simplest version, and the character has some obvious flaws. I also found it surprising that the 1st and 2nd edition versions of the Player's Handbook led me to creating a character that was nearly identical, but also the weakest in terms of sheer power. The 1st edition book is very vague in some places, and what's most interesting is that the player is not given their character's combat scores. But you can clearly see in the 2nd edition rulebook where they were simply streamlining a proven process and putting a lot of the nuts and bolts of the system into the player's hands, likely to free up the DM so he could focus on the challenges of the adventure. If you want action with superheroic characters, play 4th edition. If you want complexity and rules headaches yet clearly defined equalities and powers across all classes and races, play 3rd edition. If you want weak PCs with obvious inequalities and no sign of modern or innovative rules that enhance PCs, play 2nd edition. If you want even weaker PCs, vague but complex rules and a lot of arbitrary randomness, play 1st edition. Each has their own strengths and weaknesses for style and ease of play. Convoluted or confusing creation process notwithstanding. Or maybe you will draw your own conclusions. 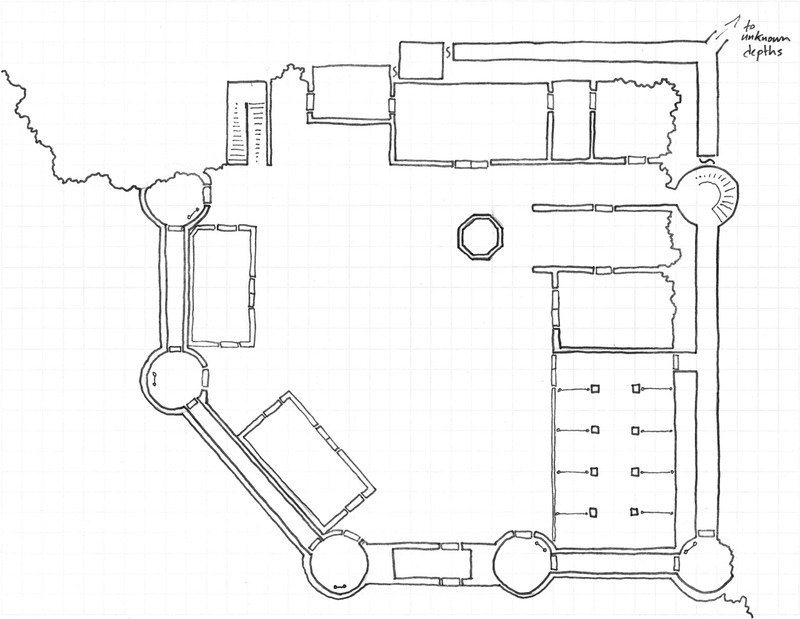 There are plenty of places online to find out how to draw or places that will teach you techniques for drawing, especially for RPG maps. Dyson's Logos immediately comes to mind! But there are scant few places where anybody teaches you how to design a map, how to make it interesting, or how to put a good adventure around it. I had this idea for a castle built into the side of a mountain, and as I worked on it, that's how I came to start calling it the Hidden Fortress. I wanted to create a defensible castle, but I had no idea what it would be defending. 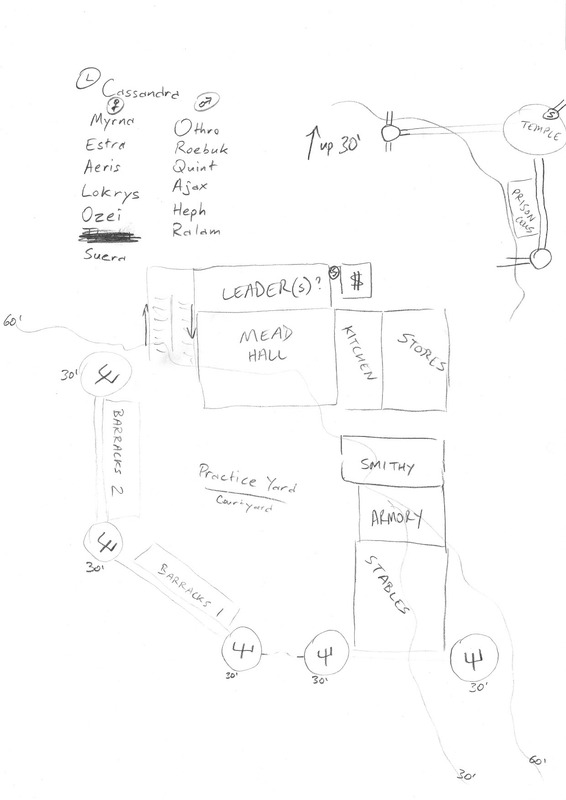 I just had this image in my head of a wall jutting out from the mountainside, so I started drawing a rough outline with some notes about what the different rooms were. I focused a lot more on the names of who would be living there than I did on what to call the place, or the reasons for its existence. 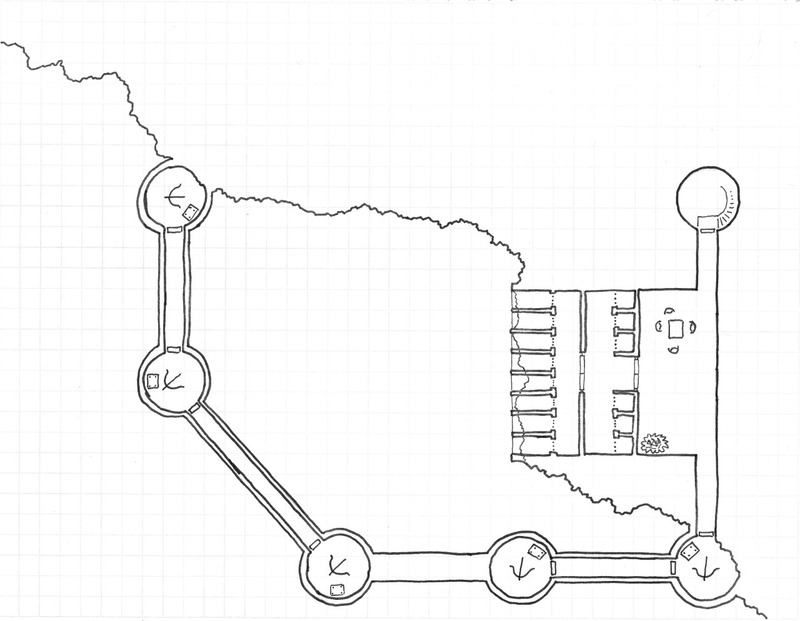 I sat down with some graph paper and started drawing rooms, making sure to connect the first and second floor towers. By the time I got done drawing and I was ready to ink it, I realized I forgot to put stairs along the walls or in some of the towers, many of the towers have a simple ladder marker. In my mind's eye this place is run by Cassandra, a cruel slaver and bandit. The prison cells have no walls or bars on the cells overlooking the courtyard below, leaving the prisoners to risk jumping down into the middle of a training ground. Some of the walls still have rough edges which were left deliberately by the builders to fool any invading force into thinking the fortress didn't extend deeper into the mountain. Beyond that, I haven't really detailed it. I'm thinking of redrawing it and putting a town around the outside wall. This is a simple dagger made of iron. It appears to be slightly dull and the handle is made of wrapped leather that appears torn at the ends, as if it may unravel if used too much. The dagger itself is impervious to harm, though the leather wrapping is just the most recently fashioned handle. If wielded against an opponent it will inflict 1d4 damage. If a sapient (Int 2+) creature is killed with the dagger, the wielder will feel a surge of energy from the blade and the damage will increase to 1d6. Killing a sapient creature continues to increase the die type of damage every time one is slain with the blade itself. Thus 1d6 becomes 1d8, 1d8 becomes 1d10 etc. until it maxes out at 1d100 (if the GM has access to other die types such as d16s and d24s she is encouraged to include those as well). If the dagger is lent to another person, or even touched by a sapient creature other than the current wielder, the damage die type resets back to 1d4. This simple unmarked band of gold was once around the ring finger of a prominent magic-user who was married to another magic-user of some talent. The ring was created so that their spouse would never get lost in their work and always come back to their mutually shared home to rest. The names of these magic-users have been lost to time, but the legend of the ring remains and for many wielders of magic who construct their own towers it would be a valuable prize. The ring only works for magic-users, and nobody else is capable of getting it to work. It allows the wearer to visualize a place they have been to before and instantly teleport there, but it must be a very familiar place to the wearer. The ring can be used as many times in a day as the wearer wishes, however the second time the ring is used it will always teleport the wearer back to the exact location they teleported from before. In fact, if they haven't returned by midnight of the same day (from where they teleported from) then they are instantly and against their will teleported back. The ring will not function according to command, or for anybody else who attempts to use it, until the "return trip" has been made by the original wearer. Removing the ring will not prevent the "return" teleport, as both the wearer who used the ring and the ring itself will teleport back to their original location at midnight of that day. If the ring is used and the wearer dies, then at midnight their body and the ring teleport back to where the ring was first used. Across the sea there is a city of towers and buildings that stretch unbelievably high, and to reach these places there are alleys and streets that stretch above and below ground and traverse every corner of the city's impossible heights and fathomed depths. In this city is a thief who can walk on walls and ceilings and jump from any building and land on her feet, and the gravity boots are how she does it. The boots don't actually break gravity, but they create a localized gravity field around anybody who wears them. Down is always relative to the boots being worn and outside of this localized gravity field momentum and weight mean nothing. The wearer can walk up walls and onto ceilings as if they were solid ground. If the wearer is fighting while using the boots then both they and their attackers suffer -2 penalties to hit each other, due to the weirdness of interacting with localized gravity. This also applies to missile fire directed at the wearer when the boots are allowing them to walk up walls or jump off rooftops, but doesn't apply to missile fire from the wearer. The boots do not enhance the wearer's ability to jump and if they make a concerted effort to separate from a ceiling or wall they will jump off of it but as long as the wearer can land on their feet they won't take damage from falling any distance of height (resolve a jump as a saving throw with a +4 bonus, a particularly difficult jump would have no bonus). Reverse Gravity spells have no effect on the boots while they are being worn, the localized gravity field trumps external effects. One of the dissonant things, for me, about space games is that we've learned a lot about space and the nature of space travel in the last fifteen years and all of it contradicts or deflates many of the old science fiction tropes about charting courses around stars and engaging with other starships that just suddenly appear out of nowhere. The former would be an easy task and the latter would never feasibly happen just with the level of technology we have for spaceships today. A more realistic approach would be that a ship's sensor array could be advanced enough to chart the stars. The way that Stars Without Number currently works a character must make a successful Navigation/Intelligence roll on 2d6 against a base difficulty of 7. Navigators can attempt to “trim the course” by increasing the difficulty by +2 in exchange for increasing the effective spike drive rating of the ship by +1, but a navigator cannot trim a course by more levels than their Navigation rating. Travelling within a solar system requires Navigation-0 skill, but doesn't require a skill check unless some special hazard is involved or the navigator attempts to trim the course (difficulty 6, +1 for each level of course trimming). This skill check difficulty is increased even more based on the age of navigational charts that the Navigator uses to chart their course, and if they are charting a course into unknown territory the difficulty jumps by +4. That's the rules as written. If a pilot is flying under the spike drive parameters (e.g. flying 1 hex with a drive-2 engine) and not attempting to trim the course then there is no need to roll. Trimming a course means shortening the time in hyperspace by one day. Default is 5 days (my game, it's 6 days by the rulebook). Navigation+Intelligence, base difficulty 7, difficulty increases by +1 for every level of course trimming. With no limits placed on the amount of course trimming a player might attempt. Succeed at the roll and you arrive safely. Fail the roll, and the player must select two.